With many specifications similar to Motorola Droid X, the Droid 2 includes smaller 3.7-inch display screen but the same 854x480 resolution. 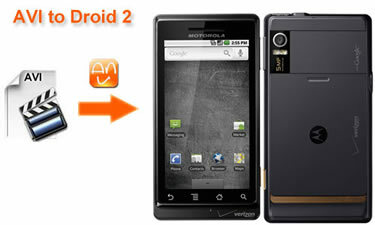 Motorola Droid 2 comes up as the first Motorola Android phone to use Android 2.2 as default OS. Motorola Droid 2 with Verizon as carrier can play many formats like H.263, H.264, MPEG-4 as video codec, and AAC, MP3, WAV, WMA9, eAAC+, OGG, AMR WB, AMR NB, WMV v10, AAC+, WMV v9, MIDI as audio codec. AVI is a media container format introduced by Microsoft, and it is widely used for editing software could export AVI and DV AVI, and some cameras records videos in AVI format. AVI files could be compressed with different kinds of codec like Xvid, MJPEG, DivX. To play AVI video on Motorola Droid 2, we need a fast AVI to Droid 2 converter to convert AVI to MP4 for playback on the Android 2.2 smartphone. Aunsoft Video Converter is the partner for your Droid 2 or Droid X phone to play movies and music anytime anywhere you like. 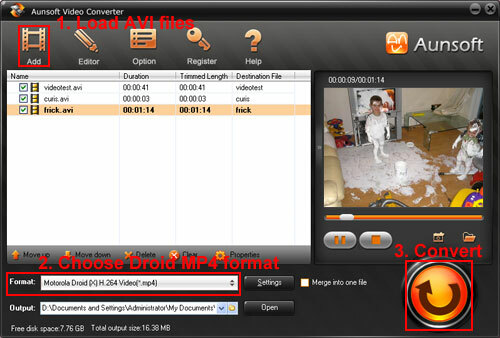 If you have any AVI video and want to transfer them to Droid 2, or Droid X, just follow the steps below about how to convert AVI to Droid 2 MP4. Step 1. Run Aunsoft Video Converter on your Windows computer (Mac users: Mac AVI to Droid converter), and click the "Add" button to load AVI files. Step 2. Choose Motorola Droid X H.264 MP4 output format by clicking the "Format" option and navigating to the Android group. The output video works on Droid 2 and Droid X. Step 3. Start the AVI to Droid 2 conversion by clicking the convert button under the preview window. After the conversion, just connect Droid 2 to computer, and transfer the output videos to Droid 2 for playback. 1. The video converter for Droid 2 also helps you convert TiVo to Droid 2, and other formats like MKV, VOB, MTS/M2TS, and MOV. The video converter transcodes AVI videos to MP4 in perfect synchronization, so that you would not face the problem on videos. 2. The Window video converter for Droid 2 is compatible with Windows XP, Windows Vista and Windows 7, while the Mac video converter for Droid 2 works on Mac OS X like Tiger, Leopard and Snow Leopard.